An encore nested FbF for this long weekend. Sometimes for FbF, I like to find the obscure and forgotten. This will do. It does answer the question though; if the French battle the French and the French lose, does anyone win? Well, it can be argued that the French won and the British/Free French lost, maybe that is why the Battle of Dakar is one of the least known Battleship duels. Let's set the scene. I wish everyone a great Thanksgiving and hope that everyone has at least a few minutes to reflect that, in spite of all our challenges, this is still the last, best hope for free society. I especially would like to send greetings and salutations to those deployed who shield the rest of us, and those Stateside who are on duty today. I know many of you just got put there on the watch bill, but a fair portion of you volunteered to have duty today so your Shipmates could be with their families. BZ. As we are just five weeks from 2014 - take one last look at the lengthening shadow of what could have been, what was - and ponder the lost opportunity due to drift and the neglect of a bored leadership. AFP got some important things very wrong. President Obama did not "order the surge" in DEC 09 - the surge began more than a year earlier. DEC 09 is when he signaled withdraw. This is all rather simple. Once again, we were played. We have sent yet another weak signal, pushed hard decisions down the road where they will be harder, punished our friends and rewarded our enemies. The Iranians will never do what we want them to do - they will do what they want to do, and that is to become nuclear. The future is still clear, the 2nd and 3rd order effects are predictable. In order to save time, I am simply going to quote myself from 2006, seven years ago. The Sunni powers will not let this stand. I would hope that many of you understand the 30-years war and what that was all about. Now picture if the Catholic and Protestant powers had nukes. Well, they were progressive minded people compared to the Jim Jones like cult that is running Iran right now. Though they really want to go Persian Empire on everyone, the Iranian issues is more religious than political. That is where the danger lies. Politicians understand negotiation and compromise. They understand give and take. Religious fundamentalists don't. They were binary before binary existed. If fundamentalists Iran gets nukes. Those who see themselves as the defenders of Sunni Islam and/or share a border with Iran, will not let that stand. 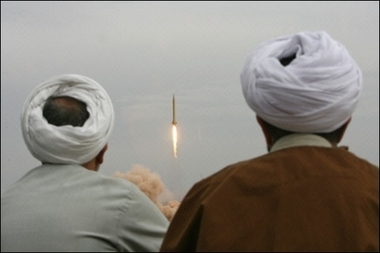 When they (the Iranians) go "click-boom" the chain reaction will follow - Saudi Arabia and Egypt will be next. To the Mullahs of Iran you can add the Wahhabi of Saudi Arabia and Muslim Brotherhood of Egypt. Yes, 2006. I thought the Muslim Brotherhood would have more staying power, but Egypt will react as Egypt needs to, regardless of who is at the levers. We have a little time here. We have options. Don't ask me which is best; they are all bad. Well - thanks for a little cyberwar, we have a little more time than we thought ... but the only people who have time in their favor now are the Iranians. I still don't have the right answer, but I know what is the wrong answer; showing weakness to the Iranians. For now, until the LCS becomes fully operational, it’s up to the Cyclones to patrol the shallows. Isn't LCS a little overkill? If you think the PC lacks a bit of punch as well, is there something that might be better for the job? Well, what are the basics? Wait ... what do I see? The Ambassador four ship run for Egypt ran $1.29 billion. That works out to ~$323 per ship. We say that we will use LCS to replace what we now use the PC for. OK, let's use LCS-1 as the benchmark. 1x BAE Systems Mk 110 57 mm gun, 400 rounds in turret and two ready service magazines with 240 rounds each. You know, the production line is open. Economy of scale makes building them even less expensive. LCS is really a bit much to do what the PC are designed to do. I had a good snort of the USA Today article on the 5-best and 5-worst run states. Let us see ... is there a common thread? 1. North Dakota: .7 million citizens; The Far West/Midlands. 2. Wyoming: .6 million citizens; The Far West. - Governor: Republican since 2011. 3. Iowa: 3.1 million citizens; The Far West/Midlands. 4. Nebraska: 1.9 million citizens; The Far West/Midlands. - Governor: Republican since 1999. - Unicameral: Non-partisan, but 30 of 49 identify as Republican. 5. Utah: 2.9 million citizens; The Far West. - Governor: Republican since 1985. 46. Nevada: 2.8 million citizens; The Far West. 47. Rhode Island: 1.1 million citizens; Yankeedom. - Governor: Independent/Democrat since 2011. 48. Illinois: 12.9 million citizens; Yankeedom/Greater Appalachia. - Governor: Democrat since 2003. 49. New Mexico: 2.1 million citizens; El Norte/Far West. 50. California: 38.0 million citizens; The Left Coast/El Norte. - Governor: Democrat since 2011. I think that tells a story quite well from a political party point of view. Nothing more for me to say than, "Bask in it." A few sidenotes. Something I noticed in the years I lived overseas; smaller nations tended to be better governed and reflect the needs of their citizens than larger ones. That plays out here a bit. Though a flawed book towards the end where his anti-Southern bigotry bled through, I've also included the one-to-two most dominate sub-national characters of each state as outlined in Colin Woodard's, American Nations: A History of the Eleven Rival Regional Cultures of North America . Hey, here is a radical concept. What if we actually followed Plan Salamander (AKA how this experiment in self-governance known as the USA is supposed to be run, I've stolen the idea from a bunch of dead white guys) to our challenges like health care - 50 experiments. If something works in one State, others will adopt it. If something is a complete Obamaesque trainwreck, then other States won't and the whole nation won't be hobbled as the State that made a bad decision tries to fix its mistake. It looked horrible when I was in my early 20s, and it looks worse when I am in my late 40s. ... and that is just when I'm wearing them. This wasn't the way it was planned to end, it wasn't the desired ending, it isn't the best ending ... but after the President's DEC 09 West Point speech, events were set in motion. More often than not, it isn't what you want, what you think, what you wish, or what you believe ... it just is. The mature professional has to accept things as they see them. Over at NRO, I think Bing West has outlined it well. 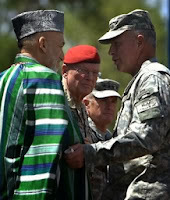 President Karzai has put his ego above the future of his country. By his deceit, he has sown such distrust that events of the next month, let alone next year, are unpredictable. The U.S. does have the credible option of walking away. Karzai has so alienated the American public and Congress that it is unlikely we will pay $6 billion a year, regardless of what President Obama pledges on an agreement he has done nothing to sell to the public or the Congress. The ironic thing is this; in the end we may wind up doing what some neo-realists wanted to do from the start - but the international community (cue the Bonn Agreement of DEC 2001) and those who wanted to save the world wouldn't even consider. We go in to AFG, fix the enemy as best we can, kill their people, break their stuff, and then go home and let our proxies try to make it work as best as they can. Our second chance was to have Strategic Patience as an unstated Planning Assumption and take time to do Shape, Clear, Hold, Build right and move one. That is all academic. The Bonn Agreement became null and void circa early-2008, SCHB died in DEC 09, and we are where we are. The wrong person, in the wrong place, at the wrong time. How much faster would it be, and how much more range would it have. That was my first thought; what is your first tactical application? BM1 have some thoughts? When one hangs up the uniform after decades of service, but still wants to contribute to their nations national security needs, what paths can that take? How does one find a path forward, and what are the keys to success? In a budgetary challenge not seen by the US military in two decades, what are the important "must haves" that need to be kept at full strength, and what "nice to haves" may have to be put in to the side? What are the legacy ideas, concepts, and capabilities that the Navy and Marine Corps need to make sure they maintain mastery of, and what new things are either here or are soon on the way that we need to set conditions for success now? Our guest for the full hour this Sunday from 5-6pm Eastern to discuss this and more will be Robert O. Work, Col. USMC (Ret), presently CEO of the Center for a New American Security (CNAS), and former Undersecretary of the Navy from 2009-2013. After 27-years of active duty service in the Marine Corps, Work joined the Center for Strategic and Budgetary Assessments (CSBA), where he focused on defense strategy and programs, revolutions in war, Department of Defense transformation, and maritime affairs. He also contributed to Department of Defense studies on global basing and emerging military missions; and provided support for the 2006 Quadrennial Defense Review. During this time, Work was also an adjunct professor at George Washington University, where he taught defense analysis and roles and missions of the armed forces. In late 2008, Work served on President Barack Obama’s Department of Defense Transition Team. He earned his Bachelor of Science degree from the University of Illinois; and has Masters Degrees from the University of Southern California, the Naval Postgraduate School; and Johns Hopkins School of Advanced International Studies. Almost three years ago we covered the letter to family and friends concerning the death of 1stLt Robert Michael Kelly USMC, who was killed in combat in Sangin, Afghanistan leading his Marines. Reader JW reminded me this week that there is some updates that we really should have covered here. His father followed up with a speech, you can get the full text here, but it is better to watch the speech. Not much more for me to say, as the father and Marine says it all; Lt. Gen. John Kelly, USMC. For this DivThu, let's have a little fun laughing at the (D)iversity Bullies - then a little naming and shaming. They are at their most funny when they start to second guess themselves, yet as they have their jobs to justify and protect, they still need to keep things going. When they are doing their best to stay under the radar, one of the first tricks they like to play is, "Let's change our name!" Add a few syllables along with some incredibly vague title ... and there you go! "compadres?" - so I guess that is a group email? OK. Maybe comrade would be better? I digress. 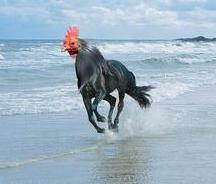 Ahhh, EDOGC. "Awareness" - another of their favorite words. We must define our terms. What are we "guiding?" What is our path? What is our goal? If you would like to make a difference for our community by being part of an exciting change effort, we need you. Change? What change, pray tell? The CNO recognizes that the perspectives of a diverse force are critical to meeting the challenges of Navy's highly technical service. To achieve this, the ED Community needs to continue our focus on recruiting, mentoring, developing, and retaining personnel. In addition, because of our expertise and training, we are also uniquely qualified to lead the Navy in outreach, mentoring, and youth programs that support Science, Technology, Engineering and Mathematics (STEM). Use the CNO's name in vain in order to justify your vile discrimination. Nice. And, as we have documented in many DivThu prior, we know what they mean about "diversity." It is what their metrics track; race and ethnicity. It isn't academic background, that is for sure. So, where does that get us right now? We have a group whose goal is to "guide" the EDO community through a "change" focused on race and ethnicity. Of course. Can we speak about what they want to do? Well, their metrics and PPT told the story already. Instead of "their" perhaps we should use "our" - as they are acting in the Navy's name. OK, I can do that. I'll say it. Our goal is to get rid of as many white men as possible so to make our group pictures look better. That is our goal. That is our change. A guiding coalition is a group of people empowered to create a vision, decide on what actions to take and measure, and start building the "wins" that generate the sustaining energy to learn, adapt, and change. The intention is to create an Engineering Duty Officer Guiding Coalition (EDGC) which is an evolution of the Diversity Working Group (DWG). There's your tell. The DWG, you remember them! They had to change their name to get rid of the "Diversity" so as to not bring attention to their actions by the speed readers. The EDGC will be made up of approximately 25 volunteers at all levels, qualified and unqualified, from the entire ED Community. The EDGC will create a vision to address the priorities of the ED Community and the personnel in it. Sub-groups will be chartered as necessary to go work on specific actions aligned to the EDGC vision. Address the priorities of the ED Community aligned with the EDGC vision. So, notsomuch engineering excellence, but making sure we have favored and unfavored races and ethnicities. How progressive! How post racial! How 21st Century! An EDGC application is attached to this e-mail. A panel comprised of RDML Whitney, CAPT Scofield, CAPT Brown, CAPT Kalowsky, and CAPT(S) Hanson will select the members of the EDGC with a term of one year, after which we will re-solicit for volunteers (we will determine later if we want term limits). The EDGC will meet for an offsite sometime in Jan/Feb (face-to-face or VTC also to be determined). To set expectations, the amount of time spent on EDGC and/or sub-groups would be some number of hours a week, is not full time, and will be supported by the chain of command. Oh, to be a fly on the wall .... but please, let us see those work hour numbers. I think it would be very enlightening to add those up, with cost per hour, next time the ED community claims they are short of money and manpower. It seems that they have plenty of time and money to support the active discrimination based on race, creed, color, and national origin. An institutionalized racialist policy and structures to find ways to promote the most divisive and base human vice; ethnic tribalism. Well, there's front office support. Let us talk in clear language as adults. Should the Navy support discriminatory action where your Sailors and civilian employees are categorized and prioritized based on self identified race and ethnicity? If not, then why support such an exclusionary activity as this effort? This is not focused on finding the best engineers. This isn't focused on bringing in the best problem solvers. This isn't driven for a pursuit of excellence. No, this is driven primarily to justify the jobs and Cultural Marxist goals of the employees of Diversity Inc. Secondarily it is to make the metrics, PPT, and pictures look a certain way. Because the reasons are so obvious though can't be spoken, we have people such as the CO of the EDO school say things earlier this year about it not just, "improving demographics" - but he protesteth too much. Of course it it. Anyone who has prepared the briefs knows that. Heck, we have USNR CDR/CAPT using ADSW whose job is to do one thing; make (d)iversity PPT slides. Encouraging sectarianism and division; that is the primary focus. Why not just be upfront about it? Is it because when looked at clearly, it isn't a defendable position? Of course it isn't. In 2013? No, it isn't - and it brings shame on anyone with "USN" associated with their name. If we do support it, then, really? Is that something to be proud of half way through the second decade of the 21st Century? If we are recruiting out of college, about that 22 year old that your cadre from the (d)iversity industry is putting in their little Rassenpolitik charts - we do realize that they were born in 1991? Rosa Brooks's article at Politico got a lot of play over the weekend, but most commentary focused on the title and the gossipy nature of the "who loves who, and how is saying naughty things about who" discussion of the civilian military divide that has been around since well before the Punic Wars. No, that is not what concerns me, what concerns me are the nuggets of insight into the colossal ignorance we have from people with their hands on the levers of power. Not stupidity. No these are smart, patriotic Americans who are doing the best they can in a job their President has asked them to do. Ignorance; people put in jobs they are ill-trained for and never have the time to learn the fundamentals, or have the people around them which will properly brief things. There was the White House staffer who called me up and asked me to have CENTCOM move a U.S. drone to Kyrgyzstan, for instance, in an effort to track an alarming outbreak of ethnic violence. When I told him why I couldn’t—the chain of command just doesn’t work that way, and in any case no formal planning or risk assessments had taken place—he quickly grew exasperated. “You guys”—the Pentagon—“are always stonewalling us on everything. I’m calling you from the White House. The president wants to prevent genocide in Kyrgyzstan. Whatever happened to civilian control of the military? As if to emphasize the culture clash, after episodes like this one, the response from some of my Obama administration colleagues in the White House was bitter: Had I “gone over to the other side?” one asked. Interesting confrontation in the faculty lounge, but really? That is the conversation of some of the President's most powerful policy and decisions makers have. Let that soak in while I grab my lance and look askance at that windmill again. Some things must be confronted. Some things need to be repeated over and over, simply because they are the truth. The next part of this post will be nothing new to longtime residents of the Front Porch, I walked you through this over and over in the last half-decade. Stick with me though, as we need to review it. We need to speak it. It needs to be brought up every time the false premise is brought up. The truth must always be represented, otherwise the past is lost. Was there a single moment when Obama’s relationship with the military began to sour? 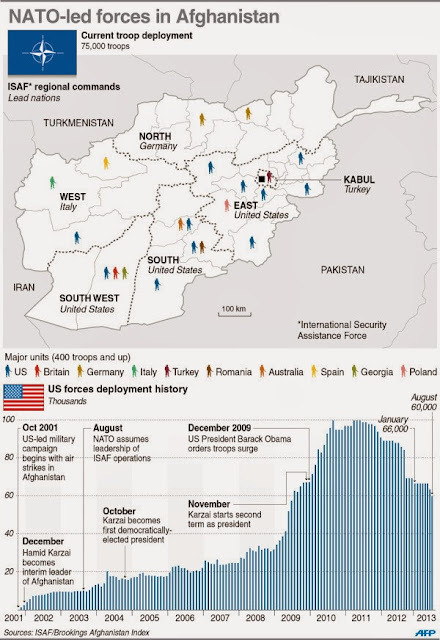 Most observers point to the bruising 2009 debates about troop numbers in Afghanistan. Immediately after his 2009 Inauguration, Obama set out to make good on his promise to “finish the job” in Afghanistan. He commissioned a sweeping review of U.S. policy and announced that he had authorized the interim deployment of an additional 17,000 U.S. troops in response to theater commander Gen. David McKiernan’s request. By the end of February 2009, the president had adopted the new strategic objectives recommended by his interagency review team: From now on, the United States would emphasize the fight against al Qaeda—and build up the Afghan military’s security forces. But by mid-May, McKiernan, the first of several Afghanistan theater commanders under Obama to discover just how elusive “finishing the job” would be, had been fired. “War is a tough auditor,” retired Marine Corps Gen. James Mattis told me. Not every commander passes muster. I don’t think Obama really realized we were losing the war in Afghanistan until late in 2009,” a retired Army general with substantial Afghanistan experience told me. Furious at the leak—which they blamed on the Pentagon—and reluctant to accept McChrystal’s grim conclusions, senior White House aides engaged in strategic counter-leaks. In their version, McChrystal and the Pentagon were trying to box in the president by pushing to deploy tens of thousands more troops and refusing to consider other approaches. After months of increasingly tense meetings, Obama came to a decision: Another 30,000 U.S. troops would be sent to Afghanistan, but after 18 months those troops would begin to withdraw. No. That is not how it happened. Here is the rough outline. The USA handed over the operation in AFG to NATO in late '05 and early '06 as ISAF moved out from Regional Command Capital. After that, NATO had Tactical and the bastardized "In Theater Operational" control of AFG through COMISAF (post '05 always an American), technical Operational Control through a German 4-Star in the NATO Joint Forces Command in The Netherlands, and the Strategic Control through SACEUR in Mons, BEL - always an American 4-Star. The USA had a parallel Command and Control Structure which was to a large measure limited to scattered USA forces and Regional Command East. COMISAF had both a NATO and a USA hat. Big difference, we would do Counter Terrorism (CT) while few others would. The Germans and Scandinavians were mostly in Regional Command North in Masar-e-Sharif, the Italians and Spaniards in Regional Command West in Herat, and the British, Canadians, Dutch, Australians, with very effective Danes and Estonians in Regional Command South. Other NATO and non-NATO nations contributed as well, scattered here and there. There was also the humorous fact on the civilian side that the AFG judicial system was to be mentored by the Italians (! ), the police by the Germans (then EUPOL), disbandment of illegally armed groups by Japan (! ), and so on. As we tired to figure out the AFG tribal situation, we soon fell in to our own tribal problems. NATO's version of USA Embedded Training Teams (ETT), Operational Mentor and Liaison Team (OMLT) never were sourced to the level promised, so training of AFG forces never got up on step in line with the OPLAN. Those OMLT who were working would not follow their Kandak from one RC to another making continuity impossible. With few exceptions (Anglosphere nations plus Dutch, Estonians, Danes, and some other nation's SOF), NATO and non-NATO forces were so laden with restrictive Rules of Engagement and caveats that they were worse than useless for any type of direct action. Each Regional Command became a national fiefdom, and drift began. NATO would not deliver the forces they promised to even inside their humble, risk adverse, low-balled Statement of Requirements. By mid-2007, inside the USA lifelines of CENTCOM and the Joint Staff - especially after NATO's failure mid-year to even send enough cargo helicopters or logistics forcing the USA to jump through hoops to make it work - it became obvious the the USA had to take the keys back; NATO could not drive the car. We had to be careful; NATO liked its new job. Other nations got their General Officers forward deployed time, and made sure they were there just long enough to get the check in the block and then move on. The Flags-to-Posts exercise was very nice for our allies. We also were in the middle of the successful surge in IRQ - we had to balance what forces we could quickly move to AFG without side-tracking the good we were doing in IRQ - and not hurting our friends' feelings by jerking back too much from NATO too fast, and then doing significant long term damage to our alliance. By 2007, the Canadians and Dutch had already signaled that their maneuver forces were leaving. Careful balancing was needed ... but we needed to stabilize AFG beyond Kabul, the north, the west, and our FOBs. When General McKiernan came in and brought to the front Shape, Clear, Hold, Build - the structure to make the change took place. Throughout late 2007 and 2008, the USA Joint Staff, CENTCOM and others looked at what was needed to execute Shape, Clear, Hold, Build, and more importantly - to take back the most difficult parts of AFG (mostly Pashtun areas) that our NATO allies either couldn't or wouldn't do what needed to be done. First forces of this "surge" started moving in by late '08 - before Obama was elected. As all plans are, it was multi-phase; nothing happens at once. After the 2008 election, Obama had his team do their little dog and pony show in theater (different story for a different day). As we chronicled here, he did a few things to put his stink on it - but nothing of any significance. The great Obama AFG surge was all, and I mean all, planned and put in to motion well before he even got the Democrat nomination. He didn't create it - he just approved it with slight to no modifications; initially. There was a point that AFG did become all his; everything changed in DEC 09 with President Obama's West Point speech where he signaled retreat via a shift from a Conditions Based Plan to a Calendar Based Plan. That was the moment that AFG was thrown to its fate. Everything since has been window dressing, vanity, and commentary. ... most of the military leaders I interviewed said they believed that military recommendations often go unheeded by senior White House staff, who now assume that a risk-averse Pentagon exaggerates every difficulty and inflates every request for troops or money. Amazing. Simply amazing. Ask General Shinseki over at the VA if he was inflating his numbers. I really want to know who she was talking to. Names would be nice. I can't speak for them, but I can speak for others as one of the guys in the cheap seats who stayed quite but saw it all play out. What she speaks of may have happened somewhere she is aware of - but not where I sat actual and via VTC in AFG, Europe, Qatar, Kuwait, and in CONUS from DC to Tamps. Let me tell you about the teams and commands I worked for/with on AFG; we never inflated numbers. As a matter of fact, we were bounded by Restraints and Constraints that kept our numbers low, but as accurate as possible. We were never ordered to inflate for the sake of inflation. We may argue of one number or another - but it was all about Troops-to-Task and forces needed to create Desired Effects - not negotiating. Not once General Officer, USA or NATO, ever directed numbers to be bumped up for political negotiating purposed. Just the opposite, more often it was about the ceiling on numbers coming from political D&G - as it should be. Deliberately lie on an OPLAN or be ordered to do so for political negotiation purposes? No; the Bull Colonels and Captains would have had head on pikes or resigned first. I never saw that at the Operational, COCOM or Joint Staff levels. If it did happen, let's see some names. Our beefy Union Thugs from Operational Planners and Targeteers Local 302 would like to pay them a visit. Carney: "Let’s be clear: the war in Afghanistan will end next year as the president has promised." Alternative explanation: they are knowingly misleading the American people. That is a different topic for a different day. A war does not end just because one side leaves the field and is being pursued by the other. That is a fighting retreat or a route. End of a war? No, the end of one phase. So, there you go. Intelligence such as Rosa's and her colleagues do not translate in to the best in military or foreign policy affairs. "The Best and Brightest" who are out of their area of expertise rarely do. No, the Gossip Girl story of the civilian military divide should not concern you - the fact that in the very serious business of fighting a war, political talking points and spin has in the minds of important people been made flesh - that is the story. You can only learn from history if that history is based on fact. Without honest history, you only set up the future for failure. OK everyone ... find your paper charts, moboards, grease pencils, and signal flags. Speaking at last week's Defense One conference, retired Capt. Mark Hagerott cited recent reports about sonic computer viruses as one way that hackers could "jump the air gap" and target systems that are not connected to the Internet. "If you take a cybernetic view of what's happening [in the Navy], right now our approach is unplug it or don't use a thumb drive," Hagerott said. But if hackers "are able to jump the air gap, we are talking about fleets coming to a stop." American is at its best when it is subtle, the "Speak softly and carry a big stick" school of national greatness. We set the example by our actions - actions based not of naked national interest of misty-eyes utopian wishfullness, but on simple Menchdom; doing the right thing because that is what a free republic does. That is the source of "power" in the oft used phrase, "Soft Power." That is the other side of the coin from the equally important "Hard Power" for what a great nation of free people must do. No modern nation can truely have global influence unless it has both the ability and the inclination to execute hard or soft power when the opportunity or requirement presents itself. I great nation never cowers from a threat or an attack by aggressive evil, but also does not ignore need. It does not strive to do for others things they can do themselves, but to give a boost and an assist to those who have been knocked down and need that helping hand. By doing so, not only does the nation do good, it accrues good will credibility that it may need when the more risky hard power is called upon. As a nation, American has always helped other nations. This is the "no greater friend" side of the "no worse enemy" phrase. Culture matters as well. Other nations and cultures may play the game, but responding to natural disasters is ingrained in the culture we inherated from the Mother Country, as have all those in the primary and secondary part of the Anglosphere. In the USA, the very brutal nature of our weather also gives us a baseline understanding of what Mother Nature can do to even the most wealthy and gifted. Tornadoes, fires, hurricanes, blizzards, earthquakes; we have that. As we often see on the globe, as the big player in the Anglosphere, we have stepped up in response to the devastation from Typhoon Haiyan with the best of the usual suspects. It is also instructive who has not stepped in. Not so instructive to ourselves, but to others. Hard power can send a message when needed, but in times of peace - soft power is essential. Because it has the organization, equipment, training, and discipline - the tool of hard power is also the best initial tool of soft power. 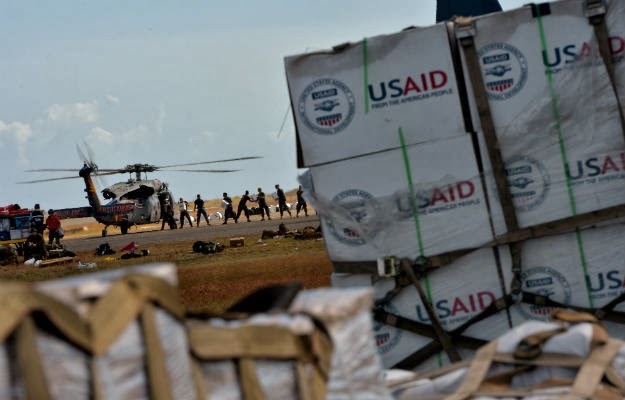 The U.S. has donated $20 million in disaster relief, ... On Friday, Japan increased its offer of aid to $52 million. The country is dispatching 1,000 troops to the Philippines in what Japanese officials have described as the largest-ever deployment by the nation's Self-Defense Forces for disaster aid. ... The U.K. has pledged $40 million in aid, while Australia has earmarked $12 million. South Korea has pledged $5 million worth of assistance and offered to send a medical mission. Naval analysts believe internal politics or China's simmering territorial dispute with the Philippines over islands in the South China Sea could explain Beijing's sluggish response to Typhoon Haiyan. "China doesn't appear able to act apolitically, even though it could make itself look like a responsible great power in the process," said James Holmes, a professor of strategy at the Naval War College. Mr. Holmes said the U.S. could benefit. "Glowering diplomacy by China drives Asians toward the U.S., the balancer of first resort, whereas smile diplomacy had Asians sitting on the fence," he said. In a good strike of planning and thought, looks like we were ready. U.S. Marines are tweaking the way they equip, train, and deploy their expeditionary units to better handle these kinds of missions. The III Marine Expeditionary Force, based in Okinawa, last year began stocking supplies needed for humanitarian assistance, such as water-purifying equipment, in the Philippines, a Marine spokesman said. Other changes, such as the addition of cargo ships to Maritime Prepositioning Forces squadrons, are meant to make it easier for expeditionary units to carry out disaster-response operations. "The faster Marines can get the right force, personnel and equipment, ashore, the faster we can mitigate human suffering," said Lt. Col. Maria McMillen, the deputy director of the Marine University's School of Advanced Warfighting. While it is nice to get all Care Bear about this - and that is fine - over at FP they boil it down to the real importance. The response to Haiyan could be a turning point for the United States in Asia: an opportunity to re-up the pivot, and to pour cold water on the narrative of a dominant China. The world is well aware of what we can do with our military as designed - but we should also make sure that we remind everyone our real national character as a representative republic made up of a free people founded on Judeo-Christian values. 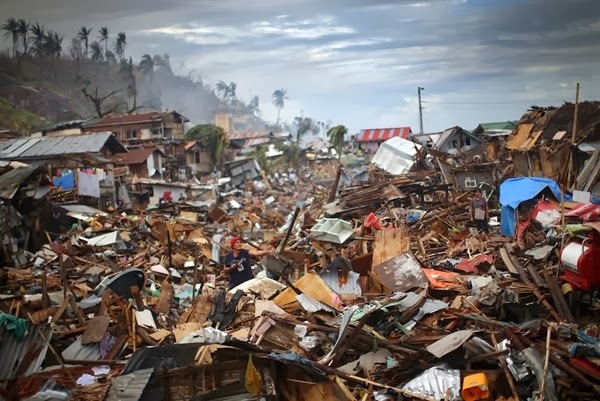 China is the world's second largest economy and closer to the Philippines than other major donors of assistance to the typhoon-ravaged archipelago. Yet the paltry $1.6 million in aid it pledged to its neighbor was less than the check written by Swedish furniture store Ikea. Pick your friends. None are perfect - but some are less perfect than others. As the wolves on The Hill start to circle the wobbly and bleeding LCS program, a few news items coming out Friday didn't help things much. First, as it should be in a moment of budgetary crisis, there is cost. You know - how affordable the program is. As my FORTRAN professor told me a back in the '80s, "Son, if your code is stupid, your results are stupid, and your grade will reflect same." “In response to a recommendation in our July 2013 report, DOD now plans to do an independent cost estimate for the program before its next seaframe contract award in 2016,” GAO says in a recent for-official-use-only report, “Littoral Combat Ships, Navy Needs to Address Communication System Limitations and Obtain Additional Operational and Cost Data,” obtained by AWIN. Well, lookie there. What is that, classic Front Porch mantra circa, say .... 2005/6? Welcome to the party, ya'll. Funny how it reads like a crisis. 2016 is over two years from now. You know, the distance from Pearl Harbor to the point where we've taken North Africa, Sicily, and were working our way up the boot of Italy. Take your time folks. Get out the abacus and tell us what you think. Seriously, that is one of the original sins of LCS; too much technology and concept risk in one package - all based on hope, wishes, and will. That has never been enough - but we tried anyway. Part of the problems, GAO says, may be in the way the Navy calculated its initial cost estimates. Navy officials say that until they have actual operational data on both LCS seaframes, it is unknown whether the modified analogous cost data will reasonably correspond to actual LCS costs, according to GAO. 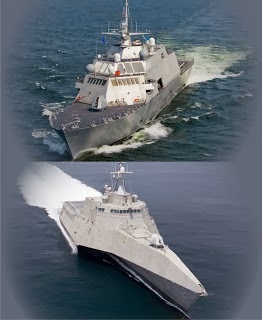 LCS: we don't know what it can do, how much it will cost, or if it can even fight ... buy by golly we want over 50 of them. Oh, wait .... did someone send the N6 shop an email? What is that other transformationalist talking point? Celestial Networks, battle networks, networked networks, two turntables and a microphone, and such? The Navy internal report’s finding that “the LCS concept depends on distance support of ships, but the [information technology] pipes to make it happen aren’t reliable yet” led to a recommendation to “accelerate implementation of the condition-based maintenance program,” GAO says. I really get tired of saying "I told you so." The bandwidth ... the EMCON issues ... etc ... etc .... yep. The Littoral Combat Ship (LCS) fleet has some communication problems that need to be addressed to enable the vessels to operate as planned, a recent U.S. Government Accountability Office (GAO) report says, and Navy officials say they are assessing the problems and GAO recommendations. “LCS depends on operational and maintenance support from the shore more than other Navy ships, so reliability and adequacy of communication systems, and the bandwidth required to transmit information, are critical to effective operations and sustainment,” GAO notes. Sensors installed on the ship relay data several times a day to shore-based personnel, who analyze it to identify any deficiencies in the equipment and plan for required maintenance. Most of the anti-LCS gaggle, your humble blogg'r included, threw in the towel at the turn of the decade and resigned our Fleet to its fate and hoped that smart people working hard would find some way to make the best of this ship inside its spoken and unspoken limitations, but really. Here we are. Don't even think about bring up FFG-7 and SPRUCAN comparisons. Don't even go with TICO-Actual's experience; we are way beyond that. We've debunked them earlier anyway. I don't know about you folks ... but, ummmm, yea. Someone throw some pixie dust around. I've been looking for a way, tangentially , to bring in a fairly good description of Obamacare to the front porch using a language we could all understand. Wes Smith over at The Corner has found the perfect description. I could not do it better. Vasa was built top-heavy and had insufficient ballast. Despite an obvious lack of stability in port, she was allowed to set sail and foundered only a few minutes after she first encountered a wind stronger than a breeze. 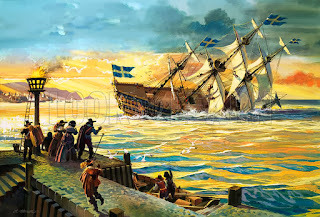 The impulsive move to set sail was the result of a combination of factors: Swedish king Gustavus Adolphus, who was leading the army on the continent on the date of her maiden voyage, was impatient to see her join the Baltic fleet in the Thirty Years’ War; at the same time, the king’s subordinates lacked the political courage to discuss the ship’s structural problems frankly or to have the maiden voyage postponed. An inquiry was organized by the Swedish privy council to find personal responsibility for the disaster, but in the end no one was punished for the fiasco. People and their reaction to power and poor leadership; timeless. As a side note, the Vasa Museum in Stockholm is a must see. Been there twice and wish I could go a third. UPDATE: Right out of central casting. Are there lessons one can learn from the most exceptional edges of the military experience that can be useful to the civilian world? Was there something from the experience of American prisoners of war imprisoned at the "Hanoi Hilton" during the Vietnam War that had to do with their success in their subsequent careers? Our guests Sunday from 5-6pm Eastern to discuss this and more will be Peter Fretwell and Taylor Baldwin Kiland, authors of Lessons from the Hanoi Hilton: Six Characteristics of High-Performance Teams. What do you have in your closet? What steps are you willing to take to pull living history out of the shadows? In WWII - are you willing to go over Nazi Germany alone, unarmed ... dozens of times? Spitfire 944. Humble ... but Fullbore. A mighty BZ to William Lorton and Jason Savage ... and Jason's grandfather, "Doc." Hat tip SS and TW. LCS: Representing the USA in WESTPAC in Style! The Kids Turned the Tables on Me! So, you want to make a name for yourself, eh? South China Sea: What Could Go Wrong?